I LITERALLY DO NOT KNOW WHAT TO DO WITH THIS TITLE. Soooooo as most of you know (if you’re new, allow me to explain send you to somewhere that explains sends you to someplace that explains), I’m participating in the #ReadThemAllThon for the next few weeks, which is totally amazing. And I’m really enjoying it! I told you all yesterday that I had already finished two books (there was a LOT more info in that post, so be sure to check it out if you want a more specific update), so this is the review for the second one! 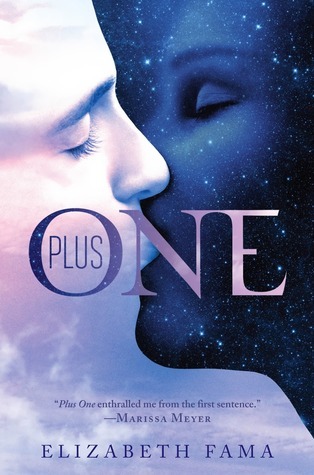 Plus One by Elizabeth Fama is set in a world where every city is split into Night and Day, Smudges and Rays. Sol (the main character) is a Smudge, an orphan, a factory worker, and abandoned by her brother. She lives with her grandfather, Poppu, who has a terminal illness and will only live a couple more weeks. All Poppu wants is to hold Ciel’s new baby before he dies, so Sol sets out to, er, kidnap the baby. Temporarily. And of course she ends up meeting a cute Ray in the process. I chose this book for the epic romance, because, well, first of all, DID YOU SEE THE COVER. DOES IT NOT LOOK STEAMY. And second of all, the description promised a Ray/Smudge relationship. AKA star-crossed lovers. That sounds pretty epic to me. Now, the romance WAS pretty epic, but I actually ended up being quite surprised, as the first half of the book had absolutely no romance. It picked up fairly quickly after that (not insta-love, more like just quickly progressing. Still sort of annoying, but they had a really good reason, so I was okay with that), and just wasn’t as steamy as I’d assumed. BECAUSE THE COVER. I MEAN, IT’S GORGEOUS. BUT IT LEADS ME TO ASSUME THINGS. In any case, I rated it 4 out of 5 stars! I thought this book was AMAZING. There were constantly plot twists. That I was in NO WAY EXPECTING. And the whole idea/world was just GENIUS and there was SCIENCE and TECHNICAL TERMS (and I LIKE CAPS) and IT WAS SO FUN TO READ. However, the end didn’t really give me closure? I totally understand why it ended the way it did, and how realistic it was, but it was pretty loosely tied. I’m wondering if there’s a second book? OH MY GOSH GUYS WHAT IF THERE’S A SECOND BOOK!!!! I’M GOING TO CHECK RIGHT NOW. I JUST CHECKED OMG IT’S A SERIES BUT THERE’S NO SECOND BOOK YET. WHY. I MUST GET ON THIS AND FIND OUT WHEN THERE WILL BE BECAUSE HELLO. NECESSARY. OKAY I TAKE IT BACK GUYS. 4.5 STARS. FULLY RECOMMEND. FANTASTIC EXPERIENCE. YES, I KNOW CAPS IS STILL ON. I’M TOO EXCITED TO BOTH TURNING IT OFF. I MUST GO EXPLORE FURTHER! TOODLES! ‹ PreviousWould you look at that! I actually made some progress! Next ›HOW ON EARTH DID THESE BOOKS NOT COLLAPSE? Hahaha doesn’t it though? 😉 You should definitely give it a try! Haha great review and 10 bonus points for the post title!